One of the biggest advances in the last five years in golf technology has been in the realm of golf swing analyzation and shot-tracking. The TrackMan is a mainstay on PGA Tour driving ranges these days, but at the price of a family car they’re out of reach for the average weekend golfer. This being said, there are several companies looking to bring these technologies within reach of the average golfer. I’ve taken a look at a number of them and this article is here to tell you which products are the best golf swing analyzers. 5.1 How can a golf swing analyzer help? 5.2 Do I really need a swing analyzer? The FlightScope Mevo Personal Launch Monitor takes the $20,000+ TrackMan technology and brings it into a price range that’s more accessible to the average golfer. It’s a truly impressive piece of technology that will help any golfer learn more about their swing and ball flight. If you take the time to learn what all the numbers mean, this can be an incredibly useful tool to have at your disposal. 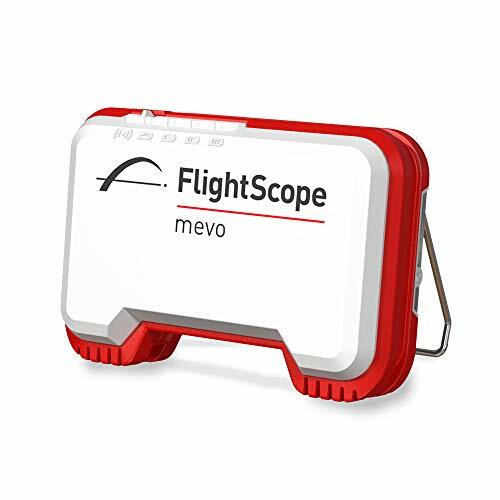 The FlightScope Mevo can be used indoors hitting into a net or outdoors on the driving range and works great in either setting. It takes a bit of getting used to when you’re first setting it up. It’s much much smaller than I expected it to be: it’s thicker than a smartphone but has a smaller footprint. You can carry it around in your pocket. The FlightScope Mevo returns these details: club speed, ball speed, smash factor, launch angle, spin, carry yards, peak height, and flight time. That’s more than enough for the average golfer to dig into to help take their game to the next level. However, it lacks things like angle of attack and clubface path that you may find from a professional-level launch monitor. That’s the tradeoff for buying something at a consumer price level. I found that the Mevo was generally accurate within 2-3% of a $25,000 TrackMan, which is really pretty good. If you have the option to take it to a range with a pro-level monitor, you can figure out the Mevo’s tendencies and apply them to your future numbers. I found the Mevo reported my ball flight was about 2% higher and about 3% longer than it actually was. However, it’s consistent in these numbers, so I was able to just do the simple math and figure out the actual numbers compared to the Mevo’s numbers. The app included with the Mevo is quite intuitive, and the video it records is great quality. The app detects the start and end of swings, so it’s essentially hands-free operation. And you can freeze the video during playback and compare freeze frames between different swings. 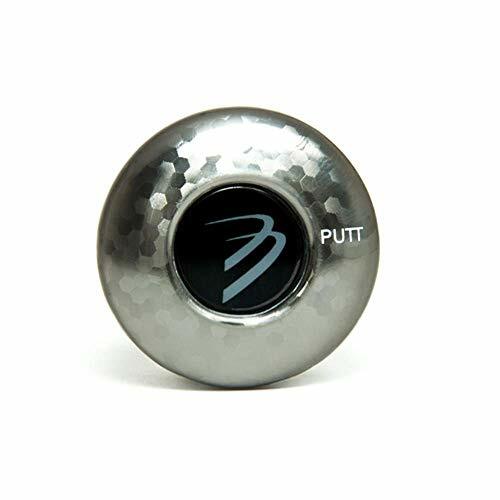 You do have to indicate in the app which club you’re using so it knows where to expect the ball to go through its radar, and it helps to have tiny metal stickers on your ball to provide more accurate tracking. This is obviously not very convenient on a driving range when you’re not able to keep the balls, but when using it at home it’s not a problem. And the numbers returned without the stickers are pretty close to what I’d expect to see. Overall, the FlightScope Mevo has the potential to be a revolutionary tool. I’m eager to see what the future holds if personal launch monitors are already this advanced. The Arccos 360 Tracking System is an ingenious method of bringing Big Data to the average golfer. 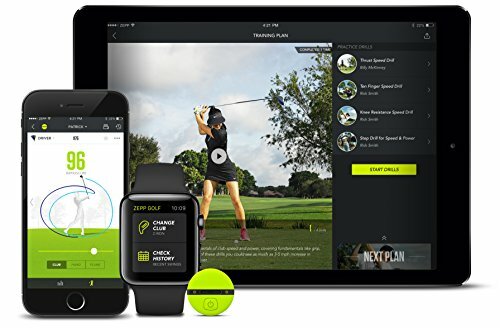 It relies on 14 tiny trackers that screw into the end of each club and report data via bluetooth to your phone, which records the shots via a GPS overview of the course you’re playing. This device is the closest thing you’ll get to a complete course management coach. 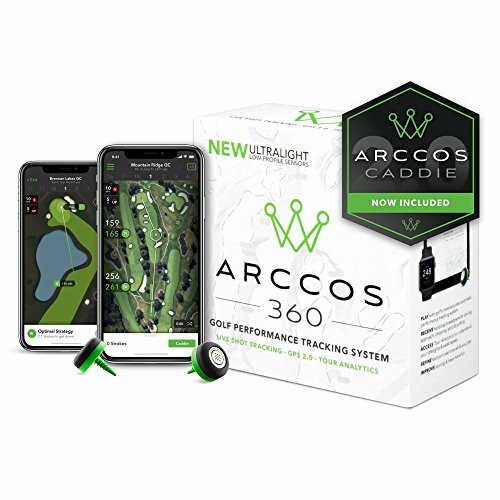 Pair the Arccos 360 system with Mark Broadie’s excellent book “Every Shot Counts” and you’ll immediately see ways to play smarter golf and make better scores. The new era of stats has overtaken the golf world. Gone are the less-than-useful stats of total putts per round and greens in regulation. If you hit 18 greens but you’re 100 feet from the hole every time, your round may look good on paper but you actually need to work on your iron play! Strokes-gained has taken over the PGA tour statistics, and it shows much more accurately who’s playing well and in what segment of the game they’re doing better than their competitors. But these stats are reliant on having an army of volunteers on the course reporting each and every shot played by every player. The Arccos 360 Tracking System is an ingenious method of bringing this type of data to the average golfer. When you’ve got all the sensors screwed into your grips, open up the app and pair each one, one-by-one. Then when you get to the golf course, it’ll figure out what course you’re on, download the map and you start your round. You do have to carry your phone in your pocket throughout the round so it can record when you hit your shot, which might be off-putting for some people. The sensors are tuned to detect whether you’re taking a practice swing or hitting a shot, and won’t record two strokes from the same spot if you take a mulligan. If you whiff, or if you notice that it didn’t record a shot, you’ll need to add that shot on later, which is fairly easy to do. This is most common when tapping in a short putt, or if a putt was conceded to you. One major drawback is if you use a putter with a counterweight, there’s no way to screw the sensor into the putter grip. Without a putter sensor, the app never knows that you’ve finished a hole and moved on to the next one. It’s a headache trying to add the putts in at the end of each hole. If you’re using a counter-weighted putter, I’d skip the Arccos system entirely until they come up with a solution to this issue. But if you’re using a regular putter, this is the closest thing you’ll get to a complete course management coach. One note: the durability score is low because the batteries on the trackers die after 1-2 years and cannot be replaced! They do offer a steep discount on replacement trackers but it’s disappointing that there aren’t replaceable batteries. Arccos’ customer service is excellent, though. Game Golf is Arccos’ top rival in the shot tracking category. There are many similarities but a few distinct differences that should help you decide which one is right for you. Much like the Arccos 360, Game Golf provides you with sensors that screw into the small hole at the end of your grip. Both companies’ sensors are small and shouldn’t affect the way you grip or swing the club at all. At a price point under $100, this is an extremely budget-friendly and helpful tool for any golfer. With Game Golf, instead of having the technology to sense when you’ve hit a shot, it’s up to you to tell it each time you’re about to make a stroke. You wear a small cube attached to your belt and tap the sensor to the cube before you make a stroke. The cube will vibrate and beep (you can set it to do one or the other, but I found both to be the best way to be sure it registered) to indicate that it’s registered your stroke. You then have one minute to hit your shot for it to register in the app. The good part of this is that you know each shot is being registered. Arccos does sometime miss shots, but if you’re diligent about using Game Golf every single time, it’ll never miss a stroke. The bad part is that it’s awfully easy to forget to tap the sensor every time you’re about to take a stroke. My advice would be to incorporate it into your pre-shot routine so something feels off if you’ve forgotten to give it that tap. However, if you’re in the thick of competition or just hit a putt and you’re heading up to tap it in, it’s easy to forget. The app is very useful, giving great feedback that should help you parse your strengths and weaknesses and use them to your advantage. Practice your weaknesses and play to your strengths and you’ll watch your scores drop. You can also use the app as a GPS to get yardages when you’re on the course, so as long as you’re ok with a 5-10 yard variance, you can skip the rangefinder. First things first: you have to have a room or garage with a high enough ceiling to take a full swing. And you have to have a net or some sort of impact absorber to catch the balls after you’ve hit them. And a hitting mat. You can, of course, use this in your backyard, but I imagine the bigger market for this is in places where the weather isn’t good enough to play outside. If your house fits those criteria, the Rapsodo is a great option for bringing a golf simulator into your home. You can even use foam balls if you’re worried about shanks or popups missing the net. Indoor golf simulators are popping up all over the country, giving golfers the opportunity to get the feeling of playing a round of golf even when the weather isn’t cooperating. The fact that many of these establishments offer food and booze as well makes them an awfully compelling destination, especially if there’s snow on the ground and several months before golf courses will open for business. Most of these places have launch monitors like TrackMan driving their simulators, so to bring one into your home hasn’t always been cost effective. Rapsodo’s R-Motion Golf Simulator and Swing Analyzer uses a different, lower cost method to bring a simulator into your home. You start by attaching a clip to each shaft just underneath the grip. These are essentially weightless and shouldn’t be distracting at all. When you address the ball, you have to pause briefly for the sensor to sync, then swing away! I found that a smartphone or tablet was sufficient to run a decent driving range, but if you’re planning to use this as a golf simulator, you’ll want to get a laptop or desktop that meets the software’s minimum requirements. It comes stock with 15 really nice courses (the best known are probably Pinehurst #2 and Congressional Country Club), and there’s an option to pay around $500 for hundreds more courses. An optimal setup would include a projector hooked up to your computer to allow you to watch the shots develop on the wall in front of you. The stats provided are thorough and useful, though I felt like every 5th or 6th shot just didn’t reflect what I felt like the swing would actually produce. It’s still accurate enough to help golfers improve at home, and well worth the investment if you’ve got a place that will accomodate the set up. 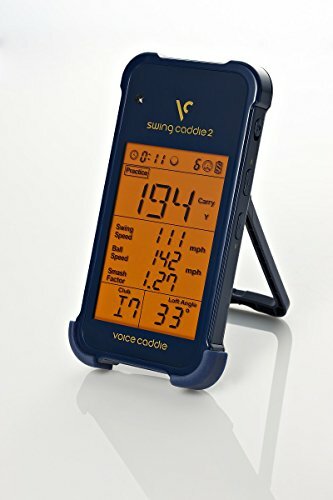 The Swing Caddie SC200 is a highly compact, highly useful portable launch monitor at an excellent price. 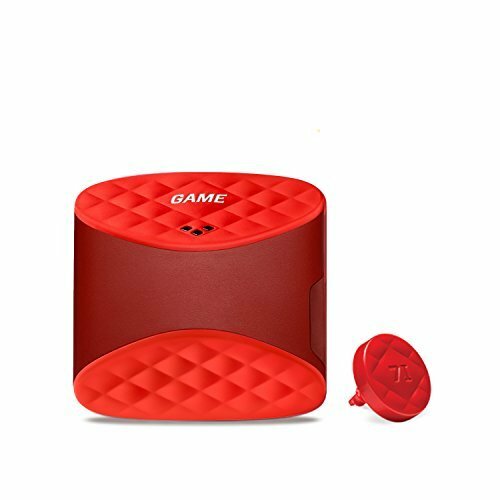 It’s about the size of a smartphone and comes with a great little cradle that makes it easy to set up on the driving range. Once you’ve got the SC200 in place, you’ll use the included remote control to choose which club you’re hitting so it can predict the launch angle and give you more accurate numbers. The remote control is easy to use but I had to push the buttons really hard to get them to register. I question the durability of what feels like a fairly flimsy remote control, so make sure you’re storing it safely and handling it gently. The SC200 measures carry distance, swing speed, ball speed, smash factor (a fun metric that indicates how well-hit the ball is — hit the sweet spot perfectly for max smash), and that’s it. So the data is useful, but it’s limited in scope. I’d rate this higher if it estimated roll-out based on spin rates, and provided launch angles. Seeing as how we’re in the “launch angle revolution” where distances are being maxed out by perfecting the launch angle for each golfer’s swing, it’s a notable omission. And if you’re hitting a driver, while it’s useful to know your carry distance, you may be losing overall yardage if you max out carry distance without thought to roll-out. It also required a reset more often than I’d like, as it seems like maybe the RAM or cache gets full and it starts to freeze up. And you have to be careful with practice swings, as it’ll register those. If you’re looking for overall number trends, you don’t want your practice swings factored in. Overall, though, this is an incredible little launch monitor for the price. After a few range sessions you’ll wonder how you ever lived without a little robot calling out your carry distances after every shot. 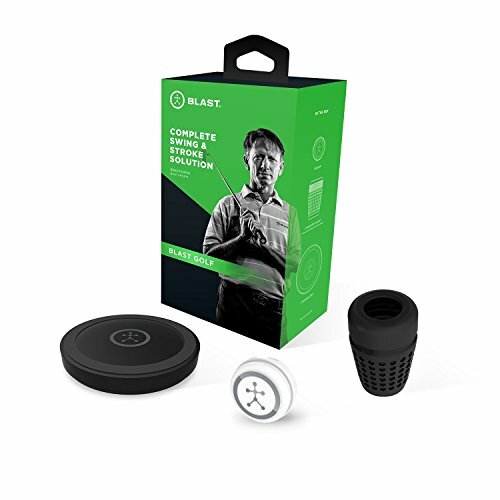 Blast Golf’s Swing Trainer is similar to the Arccos and Game Golf systems, but it’s designed for use during practice rather than during a round. It analyzes your swings at the driving range and putts on the putting green and provides drills to help you improve tempo and consistency. So while the technology is similar, the focus is different: it’s more focused on swing analysis than shot tracking and course management. While the full-swing analysis is only somewhat helpful, this thing really shines in its putting analysis. If putting is the weakest part of your game, the Blast Golf Swing Trainer is worth taking a good long look at. You may have noticed that the two previous swing analyzers reviewed both screw into the small hole at the end of the grip. This one wraps over the edge of the grip, making it usable with counter-weighted putters and oversized putting grips as well. The app is a little buggy, but if you can get it synced up, it’s a well-designed app that records important data like tempo and clubface rotation. Clubface rotation is a major influence on whether a putt will be made, but it’s often overlooked because it’s hard to measure and hard to see with the naked eye. With the Blast Golf Swing Trainer, you’ll get detailed information about your putting stroke as well as drills to help improve your weak points. It’s as good as a putting lesson, with the added benefit of being able to track your progress over time. 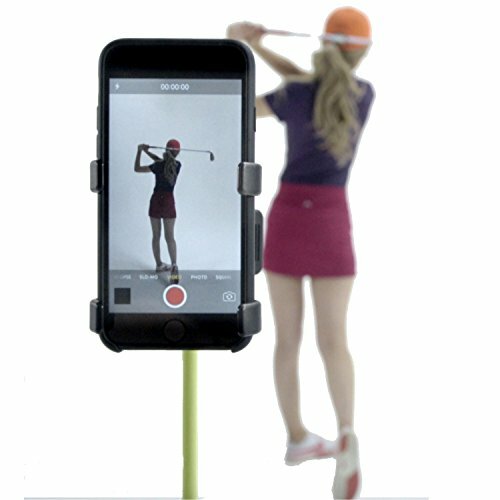 If you add in a small tripod or have a friend come along to video you (or buy a SelfieGolf clip, reviewed below), you can record your strokes in the Blast app. Having the video helps you visualize a perfect stroke and gets you closer to making more putts. The full swing analysis is good but not great. It’s clear that Blast has focused in on putting improvement, and in that department they’ve nailed it. The Zepp 2 3D Swing Analyzer is an undeniably cool device. It attaches to the back of your glove and uses that sensor to provide you with some useful data and some super cool graphics that analyze and display your swing in a 360-degree environment. However, the Zepp 2 is held back by an app that’s buggy and would often miss swings or lose connection to the smartphone or tablet entirely. While you can try using it without it being linked to your smartphone and just download the data later, it’s much more useful if you can get real-time feedback. Because this is linked to your hand movement, it has to base your clubhead speed on estimates based on the length of your clubs, so you have to enter precise measurements of each club before using it. Even with these entered, I tested the Zepp 2 against a professional launch monitor and was disappointed to find that the clubhead speed registered 10-20% off from the actual speed in a lot of cases. The driver was the most accurate, but was still about 5 mph off regularly. If that was the case with all the clubs, I’d say that this is a great unit for the price. But as I went into the shorter clubs, the variance jumped. Suddenly the Zepp reported speeds 10-12 mph slower than the launch monitor. That much of an error is enough to cause someone to start using the wrong shaft flex. So it needs a bit of work there. But oh man, the visuals that this thing provides are awesome! If you’re looking for futuristic swing analysis and demonstrations of your swing path and plane, the Zepp 2 is unparalleled. This can really help you if you feel like your clubhead loses its position in your backswing or if you have issues coming over the top and hitting pulls. Having a full visual of your swing planes can show you exactly where the club starts to deviate from the proper path. The Zepp will then suggest drills to improve your tempo and plane. It can sometimes be hard to explain how hand and body position affect the clubhead path, so the visuals provided by the Zepp 2 are incredibly useful. 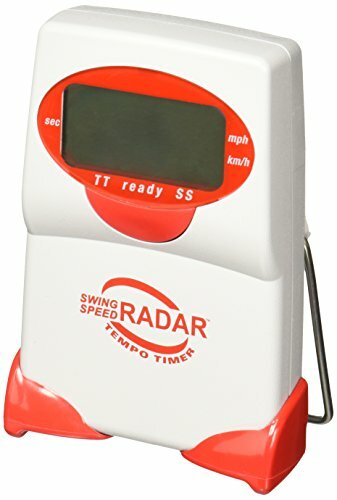 The Sports Sensors Swing Speed Radar with Tempo Timer is a very simple device that serves one purpose and serves it well: it tells you your swing speed. OK, there’s one other feature — a tempo timer — but I found that to only be marginally useful. If you’re using a speed-increasing product like the SuperSpeed Golf training system, it can be helpful and encouraging to know that the time you’re putting in is producing results. The Sports Sensors radar system will provide that feedback with a highly accurate swing speed measurement. My biggest worry is that you’ll focus only on overall swing speed and start swinging out of your shoes to try to max that number out. Sure, any golfer would love to swing the club a bit faster to eke out more yards from every shot. But I believe the best way to produce more distance is to figure out how to use the swing you have to hit the ball on the sweet spot more consistently. Unless you’re actively training to increase your strength, agility and speed, having a swing speed monitor will take your focus off of making solid contact and will encourage you to just swing as hard as you can. Be careful with a device like this, or it could start to wreak havoc on your golf swing. But it’s a reliable, accurate device that can be helpful in the proper circumstances. The GSA Putting Analyzer from 3Bays is a handy little sensor that you plug into the end of your putter grip (as long as it’s not counterweighted). It’s got a visual aid to help you line the sensor and putter up properly. Then, as you practice your putting, you can check the app for details on your tempo and face alignment. The GSA Putting Analyzer is a great tool for figuring out your tendencies with face angle. If you’re over-rotating and closing the face, you may have learned to overcompensate by aiming to the right of the hole. If you’re stuck in a quagmire of three-putts and lip-outs, you know that the fastest way to shave strokes off your score is to improve your putting. Whether it’s the middle of the season or deep in the heart of winter, putting is a skill you can practice anywhere. But just hitting putts over and over again isn’t necessarily effective practice: you may be grooving a poor stroke that’ll only set you up for more failure. Putter face alignment determines where the ball will start out, and is the single biggest determining factor in whether you’ll make or miss a putt. You can read a putt perfectly and hit it with the perfect pace, but if your putter face is just 2-3 degrees open (which is barely perceptible to the naked eye), there’s a good chance the putt will miss wide. I had some issues with the durability of the sensor as mine stopped working after a few sessions, but the company stood behind the product and sent a replacement. I haven’t had issues with the replacement so far. This is a great, budget-friendly tool to diagnose putter issues and guide you to practice more effectively. The SelfieGolf Record Golf Swing might not really belong in this article as it’s not actually a swing analyzer. It’s basically just a clip that attaches easily to your golf bag, shaft, or (preferably) an alignment stick. Clip it in place, put your phone in and press record and voila — you’re recording your golf swing. That’s it. So is it useful? Actually, yes. It’s much smaller and easier to use than a tripod. It’s secure and allows you to position the camera in any position you like. It saves you from having to bug someone to hold your camera for you, and it’s easier than trying to balance it on a headcover or something. If you’ve got a friend who loves analyzing their swing on video, this might make an excellent gift as it really is a nice, small substitute for having to haul out and set up a bulky tripod. A surprisingly large number of tour players use the SelfieGolf clip because it doesn’t take up much space but does its job rather well. Is this a product you’ll find yourself using over and over again through the year, or is this something that’ll wind up gathering dust in the basement? I have friends who buy every late-night advertised gadget they see, try it once and discard it on the pile of failed devices. Especially since a lot of these new high-tech gadgets are getting quite expensive, you want to purchase something that you’ll actually use. Is this a good deal? Even if it works, can a lower-priced item get similar results? If you’re a golfer on a budget (and who isn’t these days? ), you want to get the most out of every dollar you spend. How advanced is this product? Is it cutting edge technology or tired tech that’s outlived its usefulness? You want to be sure you’re getting the latest and greatest tech to make sure you’re on the cutting edge. Will this last through the season? Can I use it all winter and still expect it to work when next season rolls around? A lot of these items have delicate technology crammed into small packages. If you use it before (or during) the round, then stow it in your bag until the next round, is it going to fire back up the next time you pull it out? Is there a steep learning curve to use this item? Will you have to spend hour upon hour just learning how to turn the damn thing on? Sure, we all want to improve, but we have a limited amount of time. If you get frustrated just trying to get the thing to work, you’re probably not going to have much use for it. How can a golf swing analyzer help? 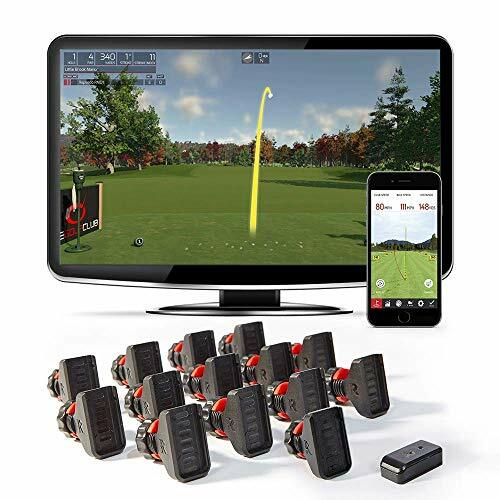 There are several types of golf swing analyzers available: launch monitors, ShotLink-style information providers, and camera mounts designed to get the best video of your swing. Launch monitors help by giving you numerical information about the ball flight. You’ll see these lined up along the driving range at PGA Tour events as the pros analyze every bit of RPM and launch angle that the launch monitor provides. Launch monitors can help you get fitted properly and to dial in the right settings on your adjustable clubs. They provide insight into what your clubhead and clubface are doing at impact once you learn how to analyze the numbers. 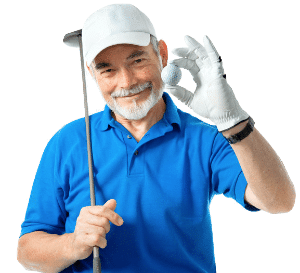 The ShotLink-style systems that provide information like PGA Tour’s ShotLink will help you in the realm of course management. They’ll provide feedback on which of your clubs produces the best results and where you’re giving shots away. These are very useful for players who feel like they’re hitting the ball well but can’t quite figure out why their scores don’t reflect the quality of their play. The classic swing analyzer is simple: a video camera. Today’s smartphones almost universally have excellent video cameras that will allow you to take HD video of your swing and usually view it in slow motion. Even if you’re not able to determine where you need to improve, you can send your video to a pro or post it online for critique. There are several products available that make it easy to get great videos at the right angle with your smartphone. This can be a low-cost alternative to the more expensive launch monitors. Do I really need a swing analyzer? There’s no doubt that swing analyzers provide a great deal of feedback on your golf swing. However, you’ll need to do some research to determine what all the numbers mean! If you have the time to learn how to interpret the numbers your launch monitor is returning, the launch monitor can be a great investment. However, if you’d rather have someone else look at the numbers and make recommendations, find a local pro with a TrackMan and take lessons from them. I very strongly believe that a shot-tracking system is well worth the time and investment. Course management is not necessarily intuitive and it’s very tough to teach. A lot of pros offer playing lessons, but since 9 holes usually takes at least 2 hours to play (and longer if you’re getting instruction before and after every shot), they can get quite expensive. Being able to track every shot and use an app to tell you where your strengths and weaknesses are can be very enlightening. You may think you’re a great iron player but find out that your long irons are above average but your wedges need work. Or maybe you hit it a long way, but missing fairway after fairway is costing you strokes. The information that shot-trackers provide can be used to immediately improve your scores without making any changes to your swing. You’ll find out how far you actually hit each club instead of having to guess, and you’ll get a better idea of when to hit a risky shot and when to play it safe.